Allcock was named an Evan Pugh Professor in 1985, the highest honor Penn State bestows on its faculty members. With degrees from the University of London, he held two postdoctoral posts, at Purdue and at the National Research Council of Canada in Ottawa, before spending five years in industry and then joining the faculty at Penn State in 1966. Born and educated in England, he retains a distinct British accent and a formal style of speech. As important as the classical petrochemical organic polymers have been over the last century, they also have a number of limitations. These include instability at high temperatures and under high radiation conditions such as ultraviolet light, x-rays, and gamma rays; poor electrical conductivity; and relatively short life compared to inorganic materials. 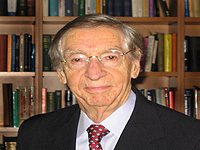 To overcome these shortcomings, Allcock pioneered a new branch of polymers called polyphosphazenes, which he co-discovered in the mid- 1960s with his former student Robert Kugel, and which his group has been expanding and developing ever since. 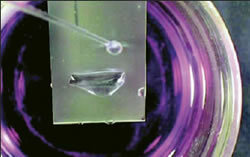 Part of a hydrophobic polymer film is exposed to an environmental oxygen plasma that turns that part hydrophilic. Water clings to the hydrophilic and is repelled by the hydrophobic sections. This work, with Dr. Seong Kim in Chemical Engineering, has potential for soft lithography and bio devices.